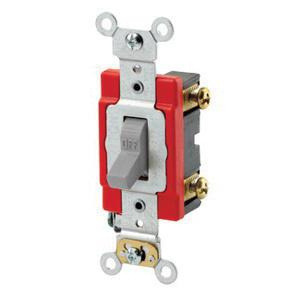 Leviton 1-Pole Extra heavy-duty toggle AC Quiet switch in gray color, is rated at 120/277-Volt AC and 20-Amps. It has maximum load capacity of 1 hp at 120-Volts and 2 hp at 240-Volts. This industrial specification grade switch features thermoplastic base and polycarbonate toggle. It measures 4.06-Inch x 1.31-Inch x 1.03-Inch. Maintained action switch with back and side-wired connection, accommodates terminal of size 14 - 10-AWG and 14 - 12-AWG. It features heavy gauge copper alloy 1-Piece arm to offer better performance.